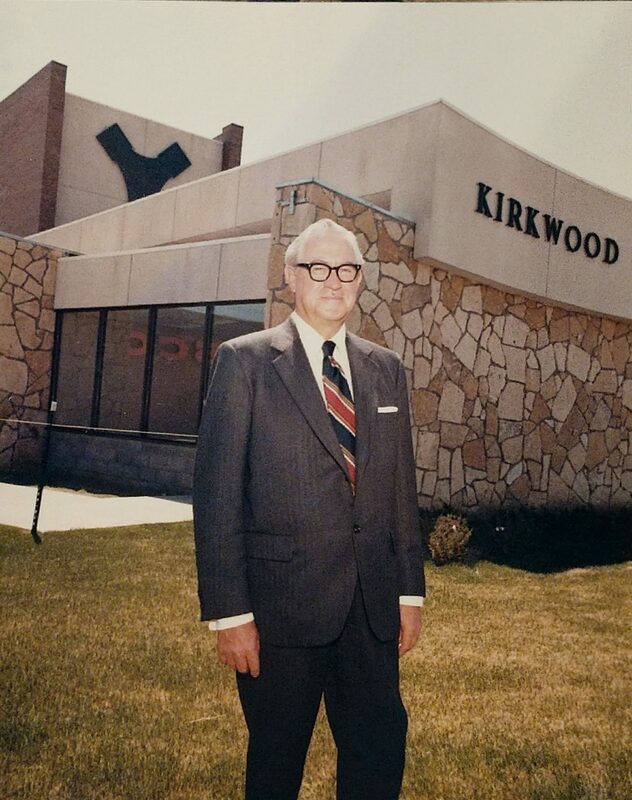 Robert Kirkwood stands in front of Kirkwood Plaza, 1971. Courtesy: Chad Wachter. Robert C. Kirkwood (1906-1998) was an executive for the F.W. Woolworth Company, holding various high profile positions that included CEO, Chairman of the Board, and Executive Director. The region’s largest shopping center, Kirkwood Mall, was named in his honor when it opened in 1971. Robert Kirkwood had formerly served as store manager of the Bismarck Woolworth store from 1932-1939. Kirkwood began his career with Woolworth in 1923 in Provo, Utah. He became a store manager in 1925 of a store in Denver, Colorado. He would later manage stores in Sheridan, Wyoming; Mitchell, South Dakota; Grand Forks, North Dakota; and Des Moines, Iowa, in addition to Bismarck. He was promoted again in 1943, serving out of the Minneapolis District Office, and later out of offices in San Francisco and Boston. In 1952, Kirkwood was again promoted and transferred to the company’s New York office. He became an executive officer in 1954, and was elected a regional vice president in November of that year. In 1955, he was appointed the Executive Vice President. Three years later he assumed the highest executive position as CEO. Under Kirkwood’s leadership as CEO of Woolworth, the company developed its first national advertising campaign, developed an electronic bookkeeping and inventory system, and established the Woolco chain of discount department stores, a concept similar to Kmart and Target. During his tenure, Woolworth also diversified itself by purchasing other companies such as Kinney Shoes and Footlocker. While a resident of Bismarck, Robert Kirkwood was involved in the Rotary Club, Bismarck Association of Commerce, and was a district Boy Scout commissioner. Mr. Kirkwood was born in Salt Lake City, Utah. He retired from Woolworth in 1970.